Submission made in a personal capacity. 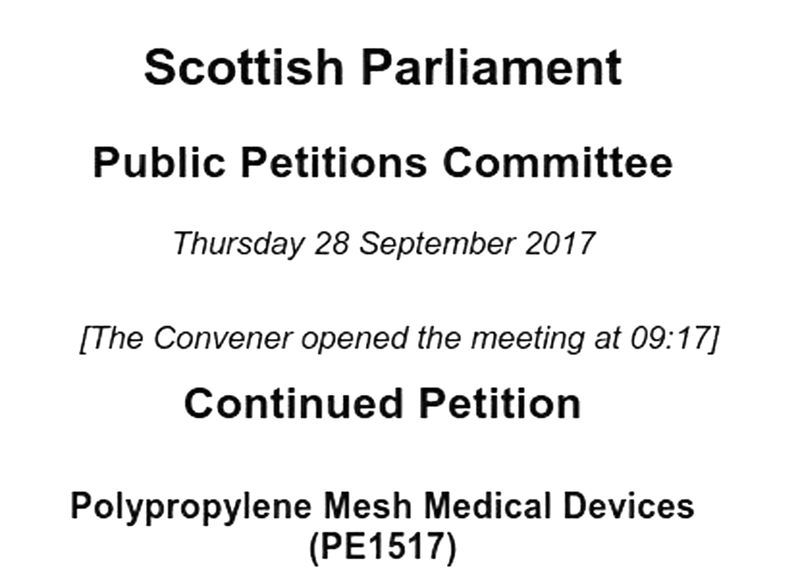 The Agenda for the Public Petitions Committee meeting of the 18th May 2017 includes a most helpful summary “Note by the Clerk” on PE1517: Polypropylene Mesh Medical Devices (Document PPC/S5/17/10/1). Having read this carefully, and in accordance with the first suggested “Action” (point 45, page 8), I would like to offer evidence. Before doing so I have listed below the most relevant sections of PPC/S5/17/10/1 in relation to the points of evidence that I wish to make. In Annexe B of PPC/S5/17/10/1 the Interim and Final Conclusions of the Independent Review are listed side-by-side. financial interest in Mesh products. since this Public Consultation was published more than a year ago. examples of iatrogenic harm may occur in NHS Scotland. What follows below are several extracts from Socialism and Hope by Neil Findlay, MSP. If you wish to purchase this book please do so through socialismandhope.com as this means a greater donation goes to good causes. I am interested in the Mesh implant scandal because of my petition to the Scottish Parliament which sought consideration of a Sunshine Act for Scotland. On the 17th May 2017 I submitted a summary as part of further consideration of on PE1517: Polypropylene Mesh Medical Devices. 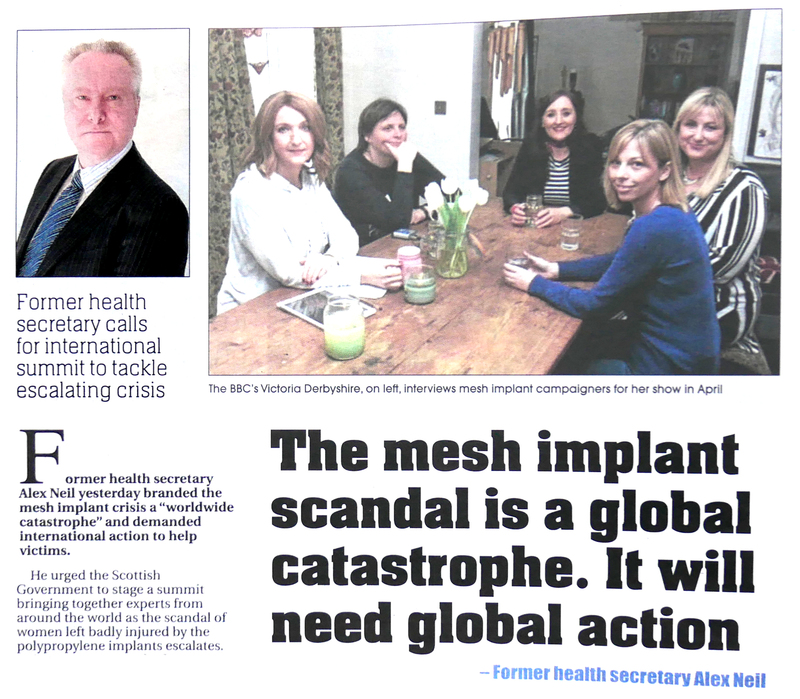 The Interim and Final Independent Reviews on the use of Mesh implants concluded that “robust clinical governance must surround treatment”. I have argued that for this to happen the Scottish Government need to listen to the people. Dr Agur was extremely good in giving evidence. He came across to me as open, genuine, careful, scientific and reflective. Dr Agur disabuses the stereotypical notion that surgeons struggle to combine pragmatism with philosophy. Dr Agur was entirely open about his declarations. Here he is an exemplar. However I retain the concern that manufacturers may have had a greater share in “shared decision making” on Mesh surgery than we are currently able to determine? 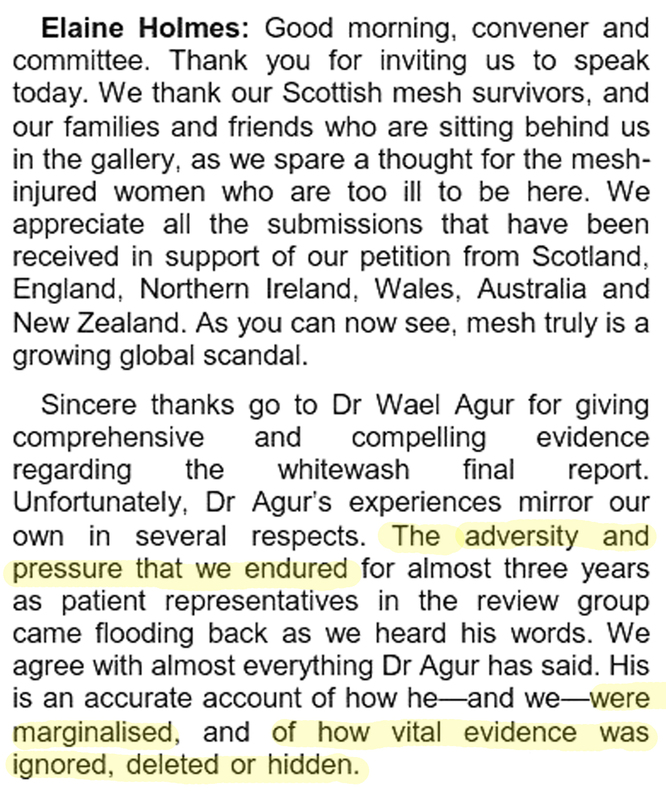 The Mesh survivors spoke incredibly well, and thankfully more openly and candidly than any of those in the systems of power that surround us. The cross-party questions to Dr Agur and the petitioners explored the issues extremely well. I have no idea what will happen from here on – but I support all the recommendations of this Parliamentary committee. We should be especially open to the consideration of what might constitute “fully informed consent”. 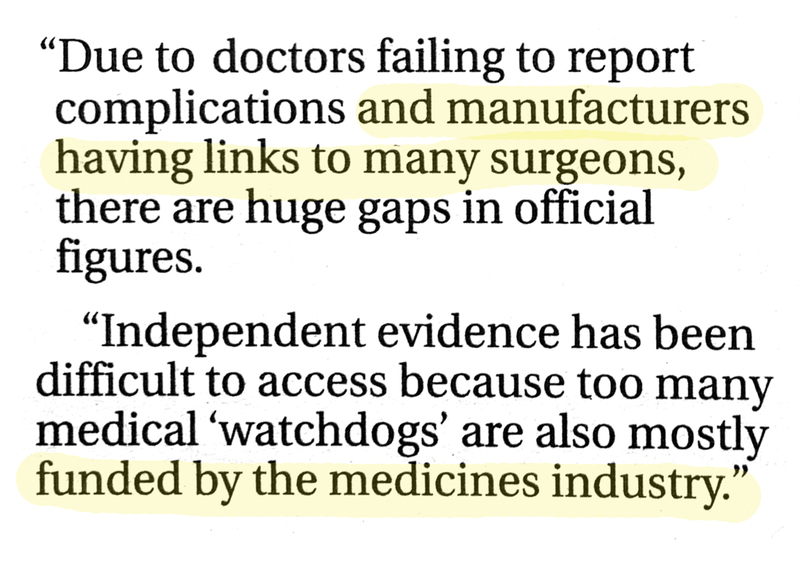 I do hope the Chief Medical Officer follows through on Realistic Medicine including the potential for science to be distorted, and patients harmed, by vested interests. on the 18th May 2017. 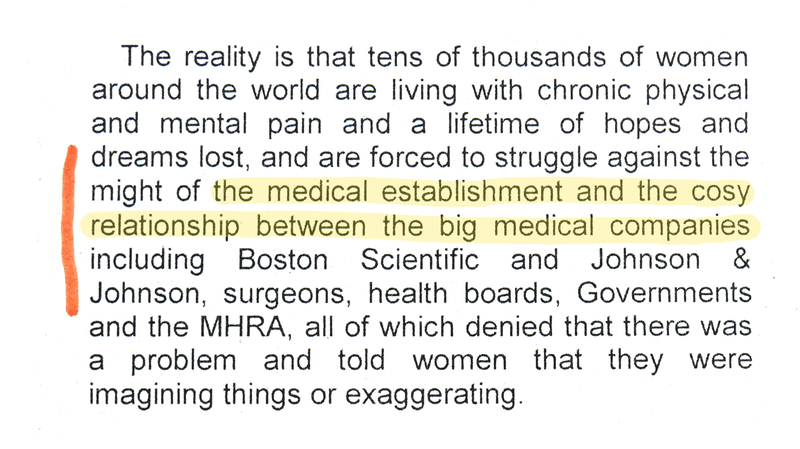 The following is a shared consideration of the potential for conflicts of interest to have had a significant role in the harm caused to Scottish women by Mesh implants. 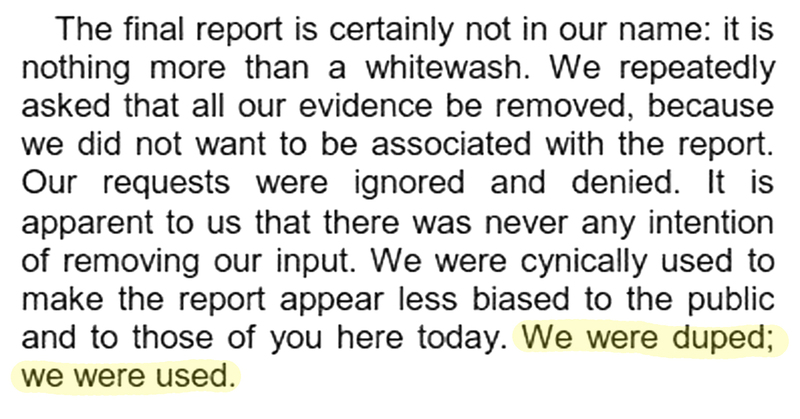 This is taken directly from the official report of this Scottish Parliament evidence session. I commend Neil Findlay, MSP for raising this important issue with and Dr Agur for his considered responses. I would also hope that the Review of the “independent review” that Professor Britton is undertaking will consider the issue of conflicts of interest specifically. 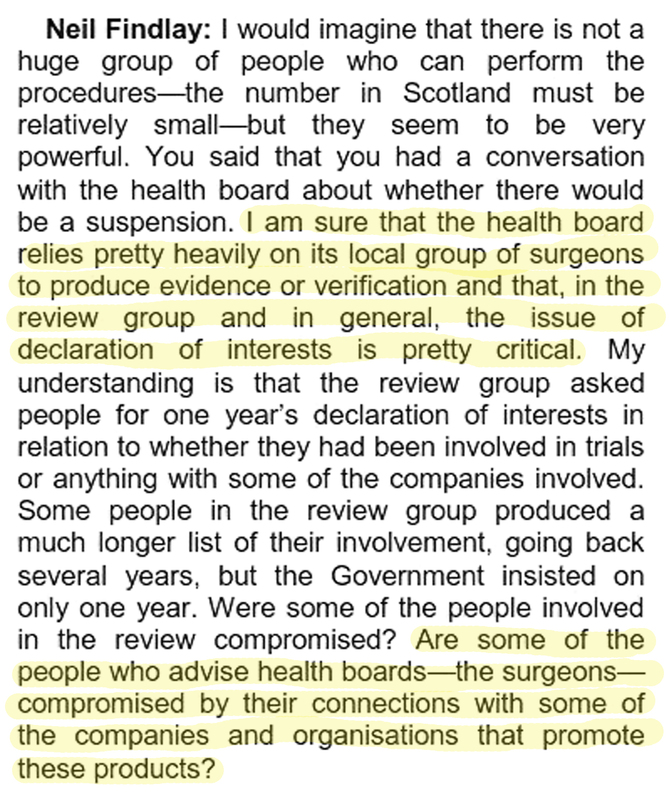 The evidence gathered for PE1493, A Sunshine Act for Scotland, established that NHS Scotland governance is failing here and that NHS Boards have routinely ignored the guidance offered. PE1493 closed a year and a half ago, after a public consultation exercise under taken by The Scottish Health Council. The majority of those consulted were of the view that there should be a public register open to all and that it should be mandatory for all healthcare staff and academics to declare all competing financial interests. 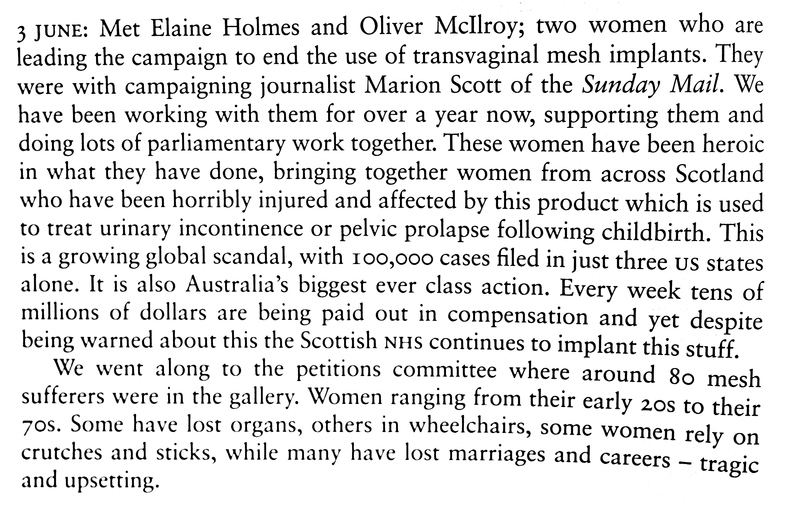 The following is an account of the experience of the petitioners, Elaine Holmes and Olive McIlroy as members of the “Independent Review” into Polypropylene Mesh implants. This is taken directly from the official report of the Scottish Parliament evidence session of 28 September 2017. A senior Scottish figure once gave me advice that it is very important to be perceived as “credible”. It is not surprising, therefore, that those who have experienced harm from healthcare may feel that they are not being listened to. 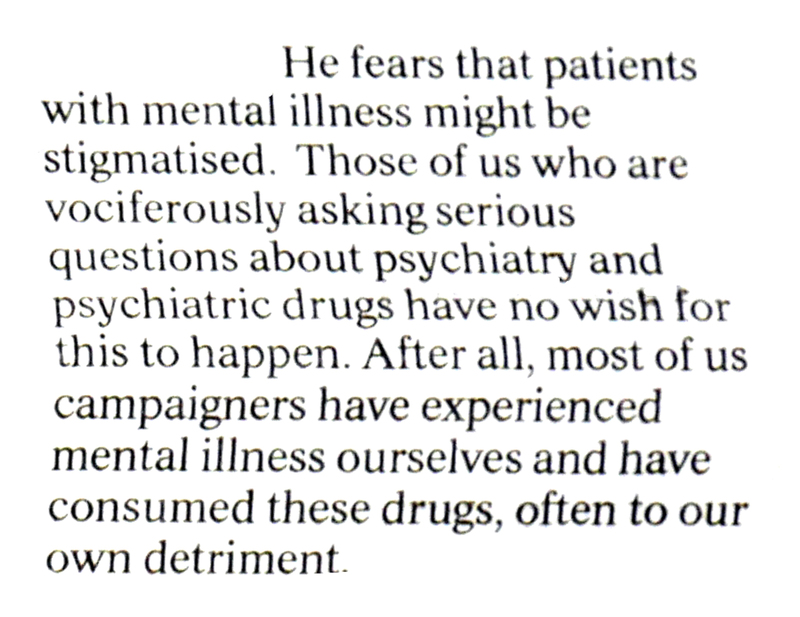 My understanding is that this series in the Herald arose, at least partly, because of a petition to the Scottish Parliament which seeks consideration of prescribed drug dependence and withdrawal. One of the explanations for the rising prescribing of antidepressants is that people are often taking them for many years. Another way of looking at this is that people are not stopping these drugs. It is still the case that we really do not understand why this may be and we are not going to understand this until we listen to the experience of those taking these medications. Experience is evidence and I find it incredible that we do not listen carefully enough to it. “introduce fully informed consent with uniformity throughout Scotland’s Health Boards”. Currently there is no regulatory requirement for healthcare workers to declare financial interests. In NHS Scotland there exists Guidance (HDL62) but this guidance is being routinely ignored by NHS Boards. This was why I raised petition PE1493, A Sunshine Act for Scotland. The Scottish Public share this view. This was established almost two years ago through a public consultation undertaken by the Scottish Health Council. An open-access, central register where all healthcare workers are required to declare financial interests would provide a fuller basis for informed consent. The Scottish public agree with David Torrance, MSP. There is longstanding evidence that exposure to industry promotional activity can lead to doctors recommending worse treatments for patients. The evidence gathered for PE1493 (A Sunshine Act for Scotland) came to the same conclusion. 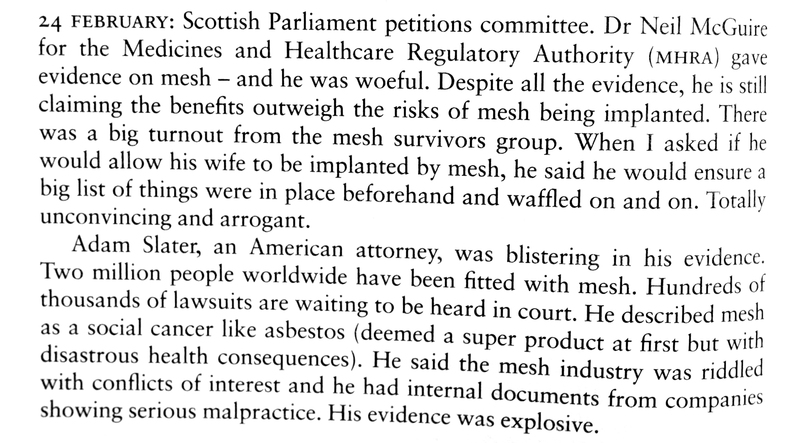 The Mesh survivors were deprived of fully informed consent and as a result dreadful harm resulted. 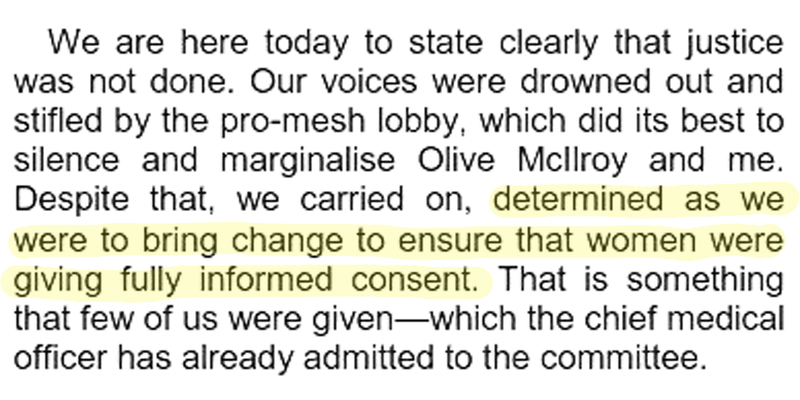 This parliamentary debate demonstrates that there is full cross-party agreement that, in order to prevent future harm, action has to be taken to ensure that consent is fully informed. Without transparency of financial conflicts of interests, fully informed consent cannot be ensured. The Scottish public came to this conclusion almost two years ago in a consultation arranged by the Scottish Government.